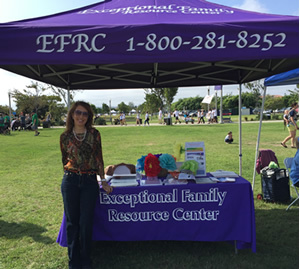 The mission of the Exceptional Family Resource Center (EFRC) is to provide support, information and education for families of children with disabilities and the professionals who assist these families. By offering emotional support and factual information, EFRC enables families to help their children reach their fullest potential. All children with disabilities will be given the opportunity to live with a supported and empowered family, fully participating within their community. 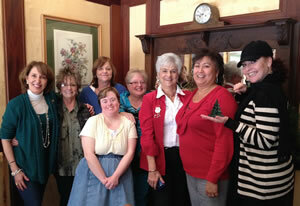 Every community will be enriched by the inclusion of people with diverse abilities. EFRC offers family centered services, emphasizing parent choice, confidentiality and collaboration. Through local, state and federal partnerships and projects, EFRC is active in advocacy, research, policy and practice initiatives. EFRC values Family-Driven Services which focus on the individual needs of your child and family. EFRC values the importance of Collaboration with professional partners to effectively serve the needs of the family. EFRC values Community-Based Practices through partnerships with education, healthcare, community agencies and services providers. EFRC values services which are Culturally Responsive to the family. EFRC values Family Choice and respects Confidentiality. EFRC coordinates and provides technical assistance to a statewide network of Family Resource Centers designated to provide family supports services to 21 CaPROMISE Local Education Agencies (LEA partners). The California Promise Initiative (CaPROMISE) represents the opportunity for multiple organizations, working in partnership, to provide a coordinated set of services and supports to child SSI recipients ages 14-16 and their families designed to increase economic self-sufficiency. EFRC is one of 47 Early Start Family Resource Centers funded through the Individual with Disabilities Education Act (IDEA) Infants and Toddlers Part C. Members are represented on the statewide network through Regional Representatives. EFRC is one of 14 Family Empowerment Centers (FECs) in CA and participates on the statewide FEDC. The California State Legislature mandated the California Department of Education (CDE) to establish Family Empowerment Centers (FEC) on Disability in each of the 32 regions in the state established under the Early Start Family Resource Centers. Senate Bill 511 (Statutes of 2001) included the establishment of a statewide Family Empowerment and Disability Council to provide assistance to the FECs. The Council must also provide coordination of training, information, and materials; technical assistance, evaluation of service delivery and management. The Department of Administration, Rehabilitation and Postsecondary Education (ARPE) and the Interwork Institute promotes the integration of all individuals, including those with disabilities, into all aspects of education, work, family, and community life. The Institute conducts research, training, and education using a variety of strategies including distance learning technologies. community. The Department’s and the Institute’s mission is supported through local, state, federal, and international organizations.